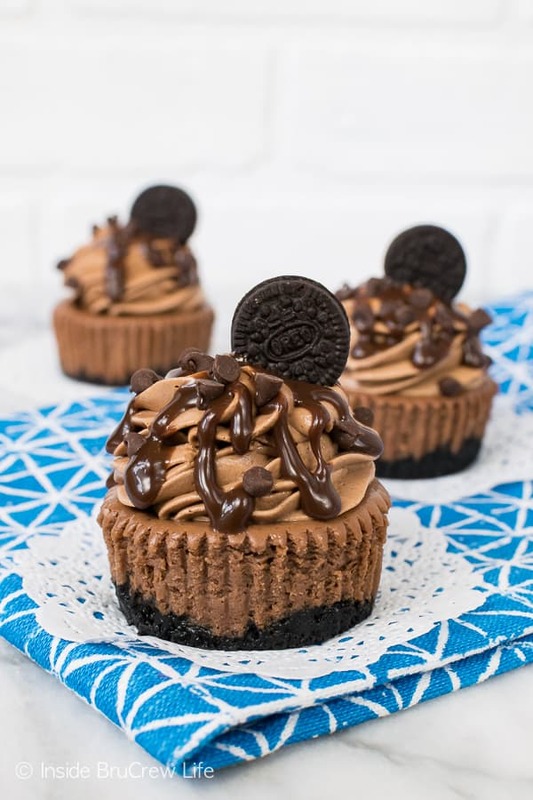 Three times the chocolate makes these Mini Triple Chocolate Cheesecakes a dream dessert for the chocolate lovers in your life. Cheesecake is one of our absolute favorites around here. I was going to wait until next month to share this recipe, but have you looked at these bad boys??? Chocolate upon chocolate upon chocolate just had to be shared immediately. These little chocolate cheesecakes were one of the treats I made to share at a party we were headed to the other day. It’s a good thing we had somewhere to go with all these holiday treats because I can’t be trusted around cheesecake and Buckeye Buttons. I just couldn’t wait any longer to share this recipe with you because they were so good. These Mini Triple Chocolate Cheesecakes are made with layers of chocolate that make them kind of irresistible!!! Ok, absolutely and completely irresistible! I might have consumed more than a person eating healthy should have, but hey, that’s the beauty of it. I can choose to eat whatever I want whenever I want. It’s all about eating things in moderation. Drinking lots of water and getting exercise also helps to balance out things like Congo Bars and Cheesecake Apple Pie. 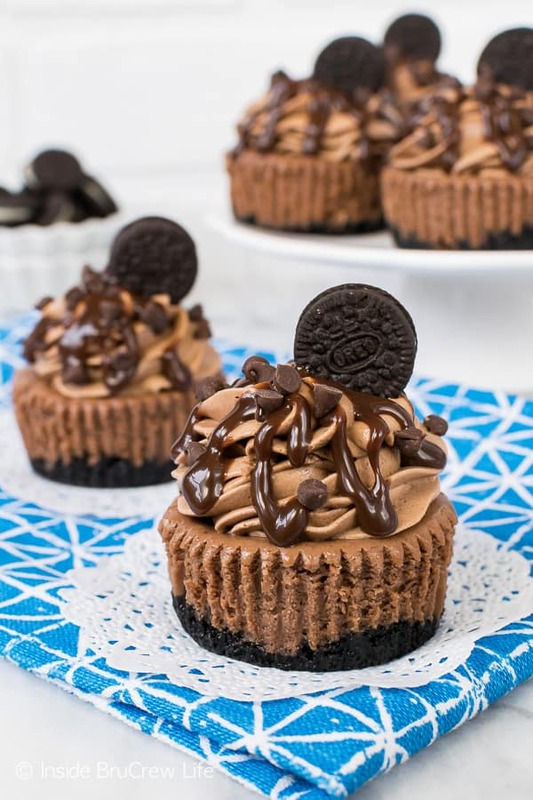 These Mini Triple Chocolate Cheesecakes are just the right size to share at parties and events. 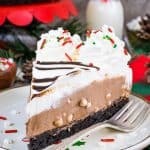 A large full-sized cheesecake is amazing and impressive, but sometimes I just want a little bite of cheesecake without all the time and effort. 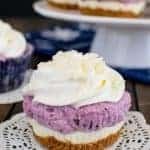 By making cheesecake batter in a muffin tin you can create tiny little mini cheesecakes that everyone will go crazy for. Line your pan with cupcake liners because then you never have to worry about your crust sticking to the bottom of the pan. Plus, it also makes them easier to pass out at parties. Layers of different chocolates make these mini chocolate cheesecakes taste amazing. Start by crushing your cookies and adding a little bit of butter to hold it together. You don’t need much because you will also leave the frosting in the cookies. 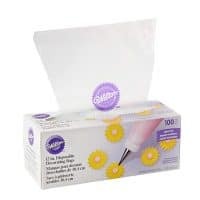 Divide that evenly into the cupcake liners and press it down firmly with a tart shaper or a smaller sized cup that fits in the bottom of the liner. Mix up your chocolate cheesecake layer and spoon that onto the crust. 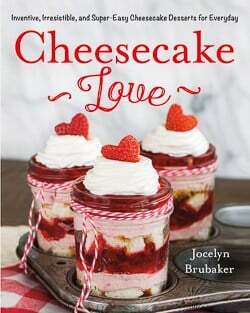 Bake and chill the mini cheesecakes. Add a swirl of creamy no bake cheesecake layer with a decorating bag and icing tip 1M. Then add chocolate drizzles, chocolate chips, and mini chocolate cookies. How’s that for a little bit of chocolate? Ha! 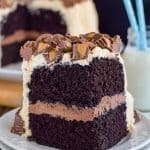 The sweet layers in this Hot Chocolate Cheesecake Brownie Cake will make you declare this the best! 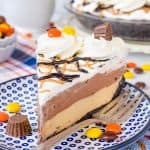 This Cookies and Cream Chocolate Pie is easy to make when you need a chocolate fix. Two times the chocolate make these Chocolate Mocha Muffins a delicious way to start out the day. A gooey Chocolate S’mores Pudding Cake is a good idea any time of year. This single Chocolate Mug Cake is perfect when I’m craving something sweet at night. Preheat the oven to 350 degrees. Place a large sheet pan on the bottom rack of the oven. Fill it halfway with water. 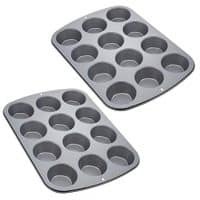 Line muffin tins with 18 cupcake liners. Place the cookies in a food processor and pulse until they become crumbs. Stir in the butter. Divide the mixture evenly into the 18 cupcake liners and press down firmly. Set aside. Beat the cream cheese and sugar until creamy. Add the sour cream, vanilla, and flour and beat again. Pour the melted chocolate into the cream cheese mixture and beat again. Use a spatula to scrape the sides of the pan. Add the eggs and beat until mixed in. Spoon the mixture evenly onto the prepared crusts. Bake 22-23 minutes. Remove and let the cheesecakes cool in pan for about 15 minutes, then remove to wire rack to cool completely. Refrigerate until chilled. Beat the remaining cream cheese until creamy. Slowly beat in the melted chocolate chips. Fold in 2 cups of Cool Whip gently. Spoon the mixture into a piping bag with icing tip 1M. Swirl on the tops of the chilled cheesecakes. Drizzle with hot chocolate, sprinkle with mini chocolate chips, and add a mini Oreo right before serving. 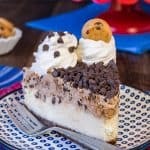 *If you want the mousse on top of the cheesecake to be lighter, use milk or semi-sweet chocolate chips instead of the dark chips. 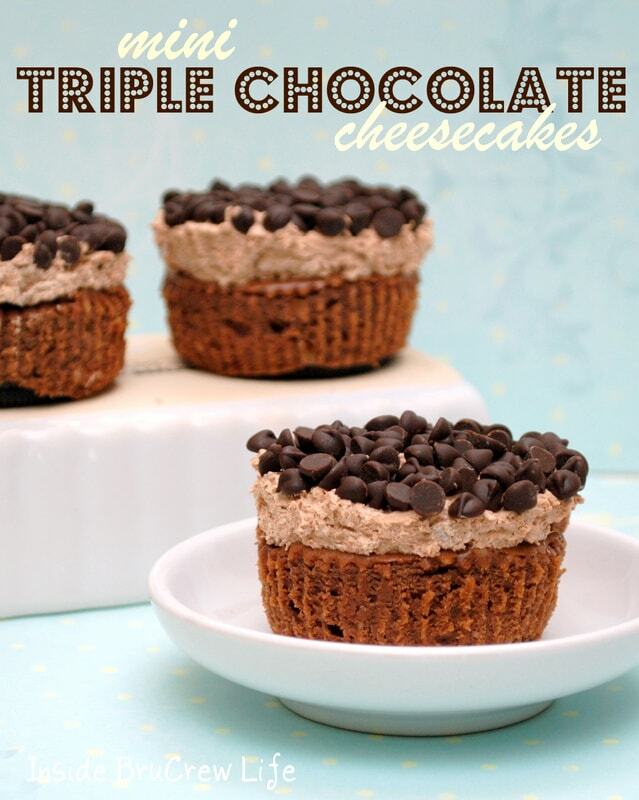 *The post and recipe for Mini Triple Chocolate Cheesecakes was originally published December 28, 2011. The pictures and recipe have been updated and the post has been republished on December 27, 2018. I value chocolate too, and man do these look enticing. Yummy!! I am definitely going to try this recipe for mini chocolate cakes. My Bicep’s likes anything with chocolate! This will be right up his alley. Thanks again for stopping by! Yummy!! I love cheesecake and chocolate too. These look delicious. Chocolate induced sleep is always good…. and these look like the perfect dessert to cause that! Thanks for the great recipe! Yummo! I’m pinning these to try soon. 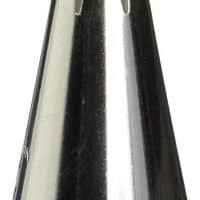 This one does deliver some extra chocolate flavor for those that never seem to get enough! Love the layers, I am ready to try these now-sleep inducing or not. Yum! i love the minis! great for portion control. although these look too good to be controlled. Wow! Yes, please! I’m totally craving one of these right now!!! These look so good! I would love to eat one right now! Would you link these up to my party? Anything mini is low calorie and cute, so it is a win win! Wow these look great… your newest follower…Happy New Year! These look like the beginning of a Happy New Year! Oh my. You may finally be the person who gets me to exercise regularly because I cannot keep coming here and not do it. The consequences are just too scary to think about! YUM! Happy New Year my friend. Can’t wait to see what you are up to in 2012. Yum! These look delicious! I found you at Crazy Sweet Tuesday. So glad I did! These look sooo yummy! 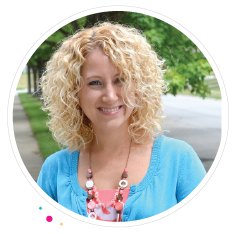 I’m your newest follower -stop on by for a visit!! I featured this yumminess today! So glad you linked it up last week and I hope to see you this week too! Oh heavens yes! I love chocolate, cheesecake, and mini chocolate chips. I’m featuring your recipe on my Facebook page tonight Jocelyn. I’m so glad that you were an inspiring part of my 2011, and I look forward to staying connected in the New Year! That totally looks amazing. I’m pinning this for sure. You had me at cheesecake…..enough said! I am so excited about these bit sized bits of heaven….this might not be a good idea..me and chocolate goodies that I can put, whole, in my mouth. I think I’ll risk it. Thanks for sharing. I bet these would taste great with the new Oreo Thins with the fudge filling! Anything to have more chocolate. Can’t wait to try these. New to your site and have decided I am in BIG trouble!!! Desserts are my downfall. I’m the person who looks at the dessert menu before she orders lunch or dinner! Looking forward to a yummy 2018! I always check out the dessert menu first too. My sweet tooth gets me in trouble most of the time. I’m excited you found my blog, and I hope you find some yummy treats to make this year! 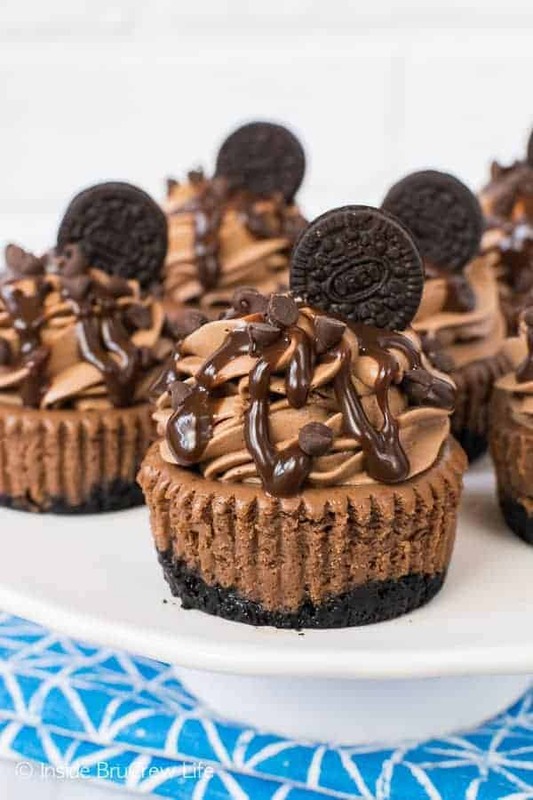 Those Oreo Thins would make an awesome crust for these little cheesecakes. GREAT pictures, makes me want to get into the kitchen. 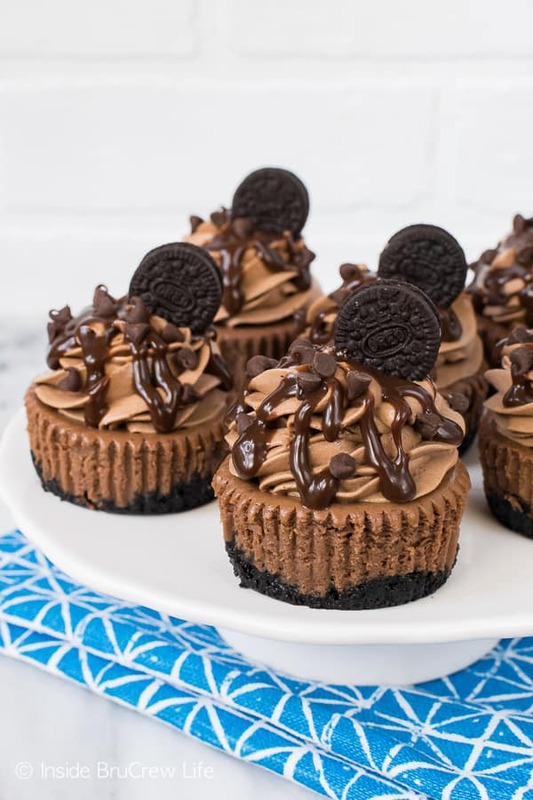 I’ve been making mini cheesecakes for a while now, and I find that the new THIN oreo’s are perfect for mini cheesecake crusts. Love cheesecake and will try these! Are these mini cheesecakes made in regular cupcake tins or the mini ones..
You are going to use a regular cupcake tin for these cheesecakes. I hope you enjoy them! Thank You…I am sure everyone will love them. 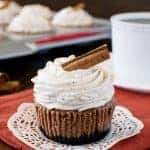 Can I make these the day before, was wondering how the top mousse part would hold up? Instead of making them individually, can I make this into one regular size cheesecake for a birthday surprise? Will the baking time change? You could bake the cheesecake batter in a 9 inch springform pan at 350 degrees for 45 minutes. Let that cool on the counter for an hour, then refrigerate for 4-6 hours before adding the mousse and chocolate drizzles. I hope that helps! I just tried these and they fell in and collapsed. Any advice? I followed recipe and even put the pan of water in (which I’ve never heard of before). When I got done with the mix, it was very light and fluffy, which I thought was weird but there are no references, so I went with it. There was so much mix for 18 cupcake papers. Any thoughts? You only made the cheesecake portion first, right? That mixture shouldn’t have been fluffy. The center of the cheesecakes will fall slightly after they cool, but not very much. It leaves a little center to fill in with the fluffy mousse mixture. Yes, I did do the cheesecake part. Do you think I overtaxed after putting in eggs? I mean it was fluffy. Mine actually fell and sagged in the center. So disappointing. Yeah if you over mixed it after adding the eggs it will add more air which can cause it to crack or sink. I’m so sorry they didn’t turn out very well. They should still taste good though!!! My husband said he will eat them. I will try again and I’ll be more careful after adding eggs. They did crack and looked more like a cupcake top when I took them out, then they sunk. Thanks for your help! I don’t eat cool whip!! Can you use whipping cream instead? Yes, you can use a stabilized whipped cream in place of the Cool Whip. I generally recommend the ratio of 1 cup heavy whipping cream plus 1/4 cup powdered sugar. They have never lasted long enough in our house to freeze them for later, but I do think they would be fine. I would personally just freeze the base cheesecake, and then defrost them add the swirl of chocolate mousse before serving. I hope that helps. Let me know if you have any other questions.